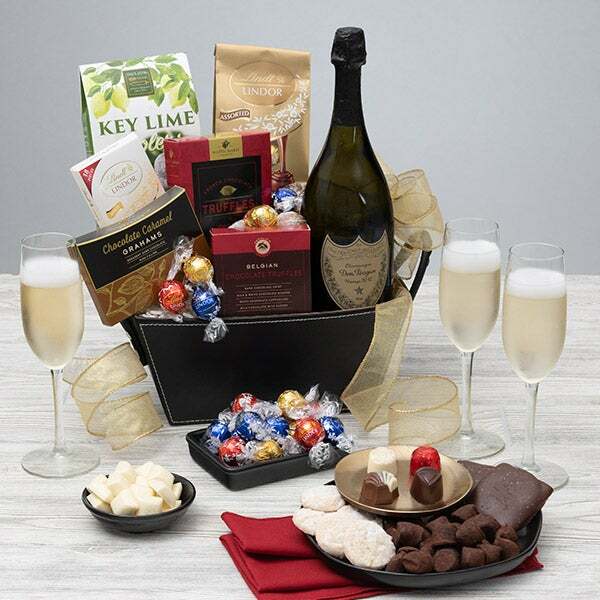 Dom Perignon Gift Basket is rated 5.0 out of 5 by 8. Rated 5 out of 5 by Laura M from Perfect gift for a client!! This gift basket made the perfect gift to send to my clients! Easy to order- loved the option to personalize a greeting card by adding my company logo! Shipped and received right on time. Rated 5 out of 5 by Brit from Congratulations I sent this as a congratulations gift to my daughter and her husband. They loved it. Rated 5 out of 5 by Steve from Classy without pretentiousness I love GGB. As a loyal customer for 15 plus years I always find a new approach to gifting that has exactly the right resonance. I always get an enthusiastic call from the people I send A GGB! Rated 5 out of 5 by Rajin from Thank you Thank you for being so thorough in your delivery & my bro completely loved the contents! Truly gourmet! Thanks!! Rated 5 out of 5 by Lulubabalu from Great Gift Baskets with Wine I mailed a couple of gift baskets for some friends who hosted a very nice dinner. After they received it, they told me they loved the wine and the basket goodies. I was happy to hear that. Rated 5 out of 5 by Ashley B from Great goodie basket!! I bought this for a male relative for his birthday and he loved it. The way the arrangement was put together could have been a little better but everything was great otherwise! Rated 5 out of 5 by laura21 from User-friendly site and service, on-time delivery! I bought a LaMarca champagne gift basket and sent it a very long distance. It arrived on time, the day before the wedding, and it looked great. I will most likely order again - very convenient and reliable way to make someone's day brighter. Rated 5 out of 5 by LauraSU from Great gift! I bought this for a gift and the recipient loved it! No matter what they’re celebrating, this stunning arrangement is sure to impress! Take your pick of one of three exceptional champagnes including Dom Perignon, which we’ve expertly paired with an unbeatable arrangement of decadent gourmet treats. Boasting exquisitely smooth truffles, slow-melting chocolate squares, and delicate cookies, this gorgeous basket is certainly a gift that will never be forgotten. Chocolate Wafer Rolls by Fusion Gourmet - 3 oz. Caramel Milk Chocolate Squares by Ghirardelli - 5.32 oz. Key Lime Cookies by Byrd - 4 oz.